As with many Cheese based Crisp, a Nose Plunge Test revealed a cheesy aroma. Nothing specific, just Cheesy. The flavour was also a pleasant creamy Cheese. 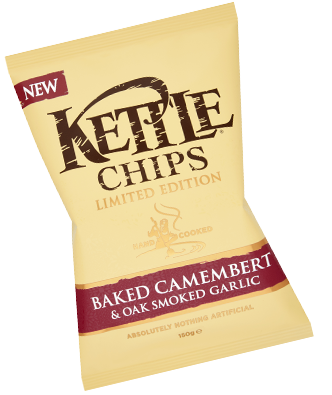 The descriptive terms used by manufacturers these days always raise a smile in the Chips and Crisps offices, and like so many it’s all a bit exaggerated – we would like to believe this is all about Crisps manufacturers having a bit of fun rather than misleading their customers. There was, after all, nothing specifically ‘Baked’ about the Camembert, which was, as said, just a Creamy Cheese. As for ‘Oak Smoked’ Garlic, that would take unbelievable taste buds to capture that unique flavour. We would describe them as a pleasant garlicky, creamy Cheese of no specific nature.